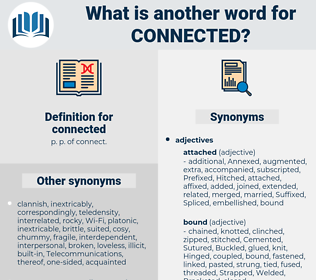 What is another word for connected? correlated, Cabled, involved, logged-in, affiliated, committed, networked, dependent, conditional, coherent, Ramped, associated, pertinent, intertwined, trendy, like-minded, work-related. Corresponded, concerning, Encountered, rooseveltpunched, Attributed, pertain, governing, bonded, Incurred, Logged, Arose, Arising, regarding, correlated, applied, rigged, Got, Cabled, involved, concerned, plugged, linked, related, hooked, associated, pertinent, tied. contacted, Communicated, collected, combined, coordinated, directed, consolidated, communication, networks, Convened, Accommodated, interfaced, selected, confused, Commingled, Confronted, conditioned, Compared, Introduced, accessibility, reflected, concerning, located, allocated, terminated, accessible, Encountered, intermingled, relates, reconciled, demonstrated, amalgamated, recorded, expected, activated, constrained, Transferred, Generated, Compiled, Echoed, suspected, initiated, identified, impacted, centred, traced, access, accessed, interpreted, opened, coupled, educated, complicated, determined, Switched, subscribed, harmonized, removed, inscribed, covered, circulated, Enabled, Culminated, entwined, acquainted, merged, Entered, Inserted, Bridged, fastened, Attributed, dedicated, devoted, Influenced, exposed, represented, endorsed, recognized, organised, Pertained, organized, triggered, transmitted, included, liaise, Delivered, knit, engaged, supported, accompanied, governed, arranged, informed, moved, partnered, implicated, Created, Subjected, Compromised, entrusted, bonded, reunited, referenced, defined, joined, Amongst, Perpetrated, hardwired, checked, registered, structured, understood, Acceded, obligated, Rendered, established, presented, provoked, assigned, gathered, respected, experienced, equipped, embedded, turned, tailored, situated, dictated, Depended, fed, mediated, induced, enslaved, granted, positioned, derived, owed, Entailed, secured, Issued, supervised, taped, assembled, imposed, specified, Anchored, welcomed, Captured, known, self-employed, Offered, Undertaken, adapted, embroiled, Targeted, supposed, Predicated, Assessed, subsumed, Been, serviced, received, adjusted, Returned, renewed, Enshrined, faced, Fitted, Filed, tuned, Resulted, accused, Performed, docked, placed, Appended, intended, spent, Incurred, Greeted, fixed, Provided, bounded, Accounted, addressed, aligned, hosted, loaded, Brought, mated, designed, paired, Submitted, admitted, maintained, assumed, Followed, Logged, focused, Installed, set, satisfied, used, fluttered, powered, added, wedded, treated, Remained, Supplied, posed, unified, justified, prohibited, mandated, obliged, Met, Worked, alleged, clipped, enmeshed, charged, Upheld, guided, Indexed, needed, mixed, Referred, Arrived, Punched, Prompted, Borne, Aimed, Served, Allowed, matched, mounted, Arisen, Lodged, fulfilled, laid, Pegged, drawn, required, HIT, Annexed, implied, led, keyed, Earmarked, listed, Grounded, framework, view, Viewed, held, Tasked, affixed, put, grouped, handed, correlated, hurt, Approached, unplugged, Carried, suited, driven, Gained, arrested, seen, branded, applied, geared, kept, Caused, pursued, Asked, Awarded, shaped, Visited, built, tabled, Believed, found, formed, Meant, Dealt, signed, sought, founded, done, based, \, interlinked, raised, made, Cabled, involved, affiliated, concerned, plugged, committed, linked, networked, related, hooked, associated, intertwined, tied. interconnected, interrelated, interlinked, connect, connecting, connectedness, concerned, connection, interwoven, plugged, unrelated, inter-linked, attributable, Pertaining, tied. connect, connecting, connection, connections, plugged, tied. uncombined, unaffiliated, disconnected, disjoined, unrelated. obscure, wireless, isolated, exploded, off, off-line. It was no wonder Ruth connected this with the father she had never seen. But there was joy connected with these trials.